I love biscotti. Twice baked, it’s the adult version of our childhood nostalgia: crunchy sweetness best dipped before being devoured. Instead of a glass of milk, though, those little bars are beautiful with a latte, a cup of tea, a mug of hot chocolate. It’s breakfast, it’s dessert, it’s your sophisticated milk-and-cookies before bed. The problem is, though, that too often, biscotti are a little too crunchy — or rather, uncrunchably hard. I once made a recipe that was so hard, I actually realigned my jaw trying to bite into one after years of it being nearly imperceptibly, but rather painfully misaligned. Though most of my friends refused to touch it, I claimed it a medical victory. But you never want friends to avoid your baking, no matter how it might accidentally give you some mandibular relief. I am no doctor — it’s not a method I would necessarily advise to anyone. Truth be told, I was lucky I didn’t break a tooth or five. 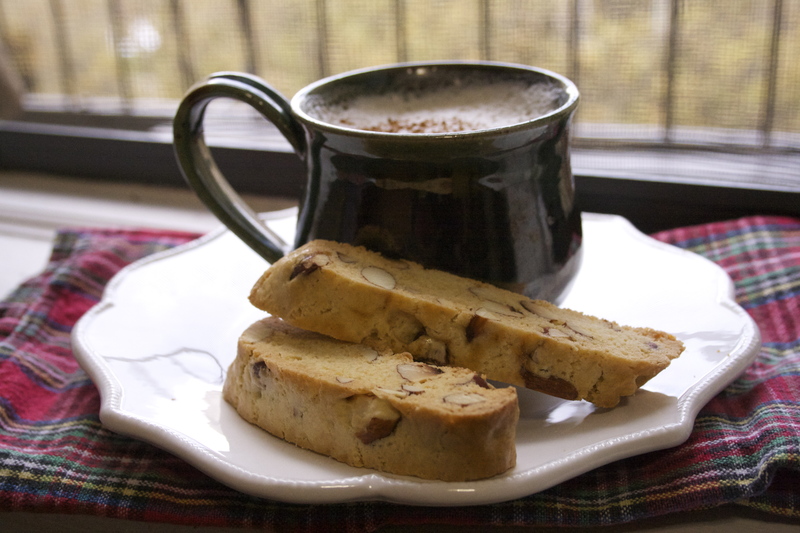 Still, I love almond biscotti, and I put it solidly at the top of my “winter recipes” list for the ImaginariYUM. But I didn’t have a go-to recipe, so I’d been avoiding making any decisions on it out of fear that I would once again find or create the wrong one and lure you all into breaking your teeth, thus making a fortune for my dental professional friends. And I’ll admit it: as much as I love experimenting, I love it even more when I get something right the first time. 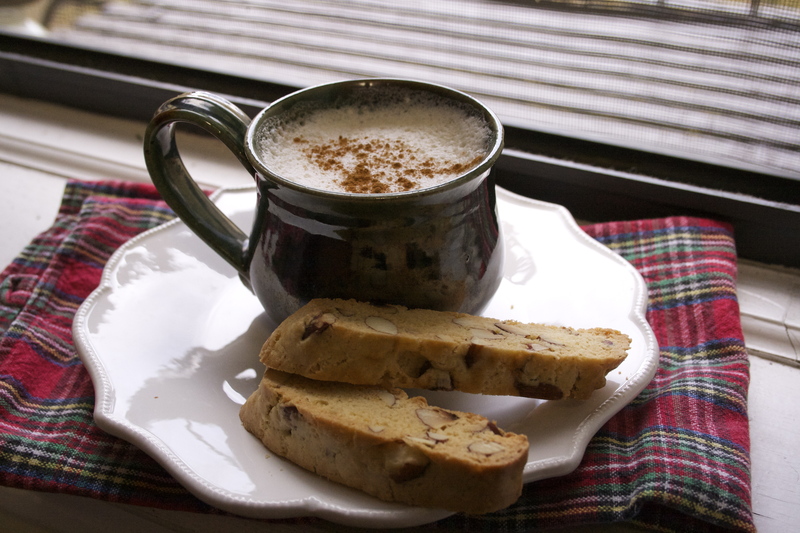 So I was lucky when Deb Perelman of Smitten Kitchen posted a recipe for gingerbread biscotti earlier this week. Not only were the spices just wonderful, but her ingredient proportions and baking times were spot on. Out of the oven a second time and cooled, the biscotti were perfectly crunchy, with still a little give in the center. I had my template. 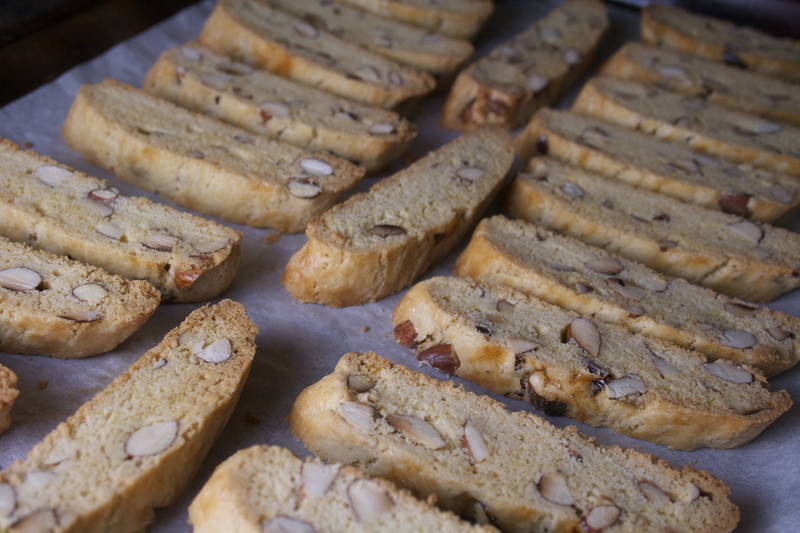 Traditionally, biscotti are made without any fat, but then it’s trickier to stray from toothbreak. Bake it only once and you have something much softer — something that is biscotti only in shape. I’ll bend to the trend of adding butter (because everything is better with butter), but I will always bake my biscotti twice, since that literally is what biscotti means. This recipe has 7 tablespoons of butter. Sort of a random amount, but it works. It also has a sort of random amount of flour — 2 cups plus 2 tablespoons — but who cares when you have your measuring spoons out anyway? A cup of sugar, baking powder, some salt, 2 eggs, toasted and chopped almonds and a bit of both vanilla and almond extracts, and hello gorgeous. You can drape your biscotti, once it’s baked and cooled, in some melted chocolate for a little extra something, but I actually found that I prefer them plain. I dipped nearly all of mine in dark chocolate (which was, honestly, a little more like semi-sweet) before I realized I like the uncomplicated nature of the biscotti — sweet and fragrant from the almonds — straight up. Don’t you worry your pretty little heads, though, they will all get eaten, in likely the same, very short amount of time it took to polish off the gingerbread ones I made on Monday. I will be pretty okay with that chocolate melting into a nice, strong cup of coffee. This recipe is based on one with a very different flavor palate from Smitten Kitchen. I highly recommend paying close attention to the baking times and staying away from the temptation of keeping them in the oven a little too long. 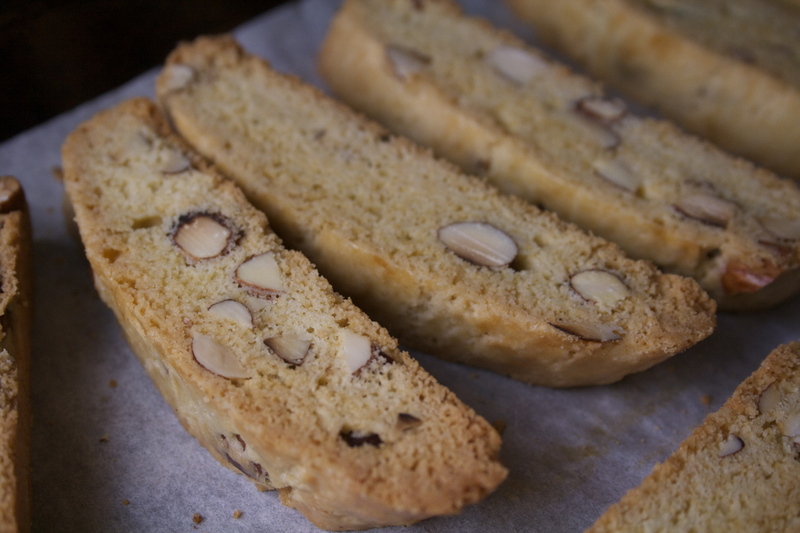 They won’t feel as firm while they’re warm as they will when they’re cool, but if you over-bake, you are way more likely to have unbearably hard biscotti on your hands. Just trust in the process. And then enjoy them with a hot cup of cocoa. No, seriously. Whisk flour, baking powder, and salt in a large bowl. Set aside. In a medium bowl, whisk sugar, butter, eggs, vanilla extract, and almond extract. 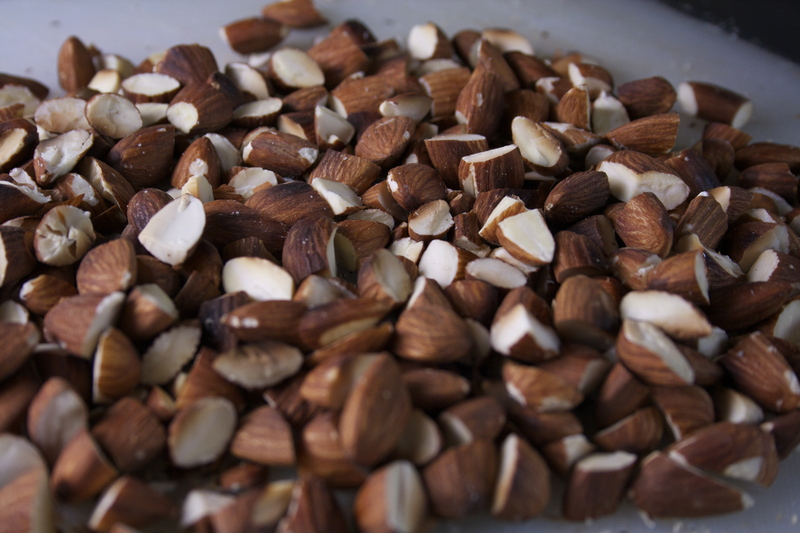 Add wet ingredients and the almonds to the dry mixture and stir to combine. 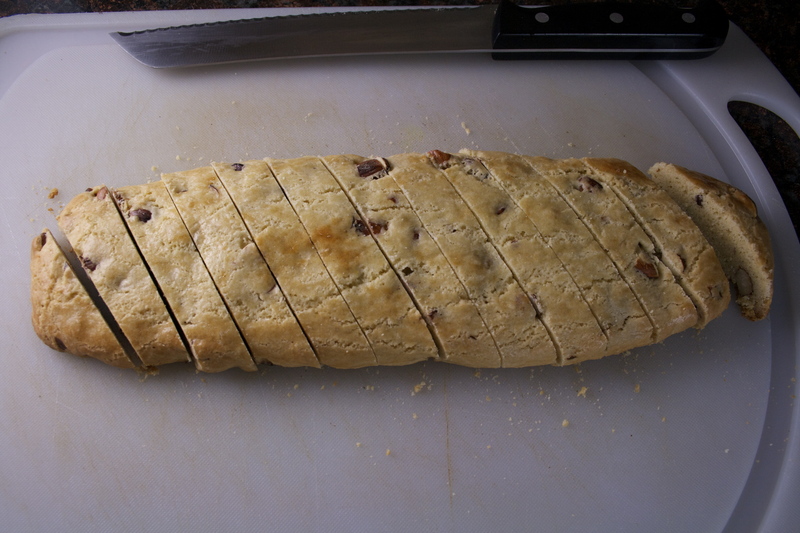 Divide the dough in two and transfer each half to your lined baking sheet. 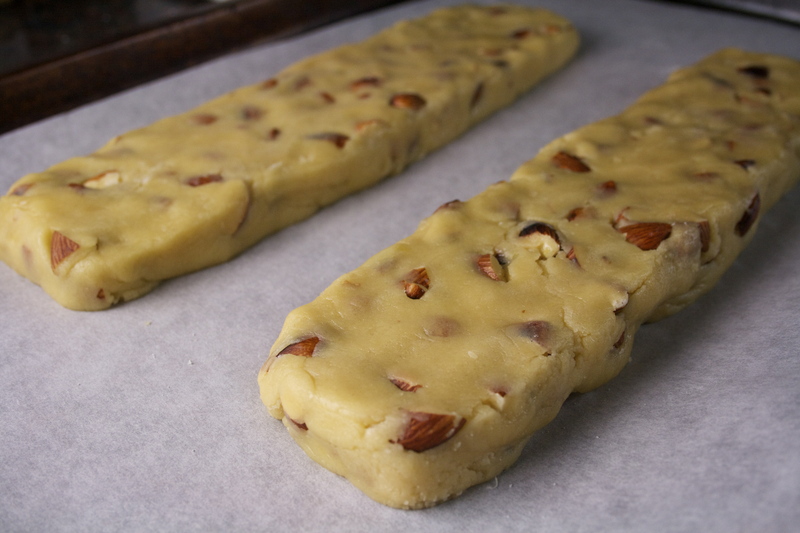 Using floured hands, pat each dough half down into a slightly flattened, 11 x 2 ½-inch log. Whisk your egg white until slightly foamy and brush the top and sides of each loaf. Bake until the loaves are golden brown, about 25 minutes. Let them cool on the baking sheet placed over a cooling rack for another 25 minutes, or until lukewarm. Using a serrated knife and a gentle sawing motion, cut each loaf on the diagonal into ½-inch slices. Arrange the slices, cut-side down, on your baking sheet (using the same parchment) and place back in the 350-degree oven for 10-12 minutes. Turn each slice over and bake for a final 6-8 minutes. Remove from baking sheet and let cool on a wire rack. 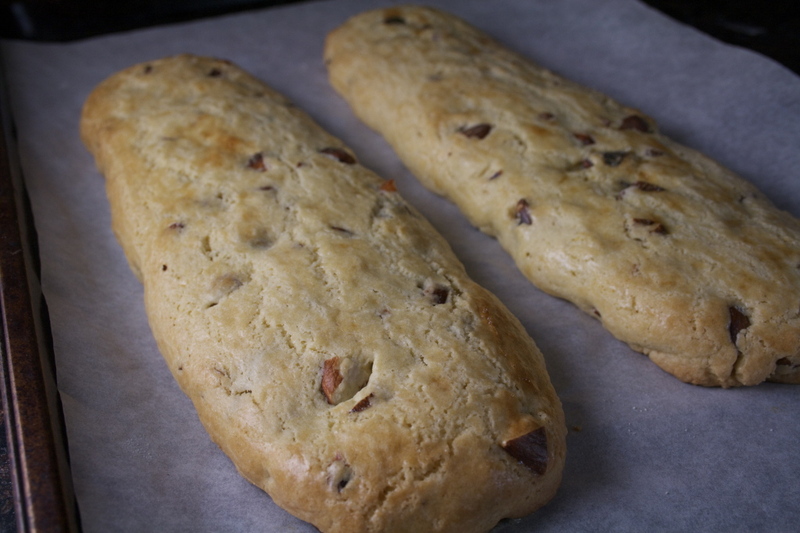 Let the biscotti cool completely. Melt chocolate in a double boiler until there are only some small chunks remaining, then remove from heat and stir to fully melt the rest. Alternately, you can place your chocolate in a microwave-safe bowl and heat in 30-second increments, stirring in between. Dip one side of each biscotti into the chocolate and let the excess drip off before placing it, dry side down, on a baking sheet lined with parchment. Let dry completely before storing. 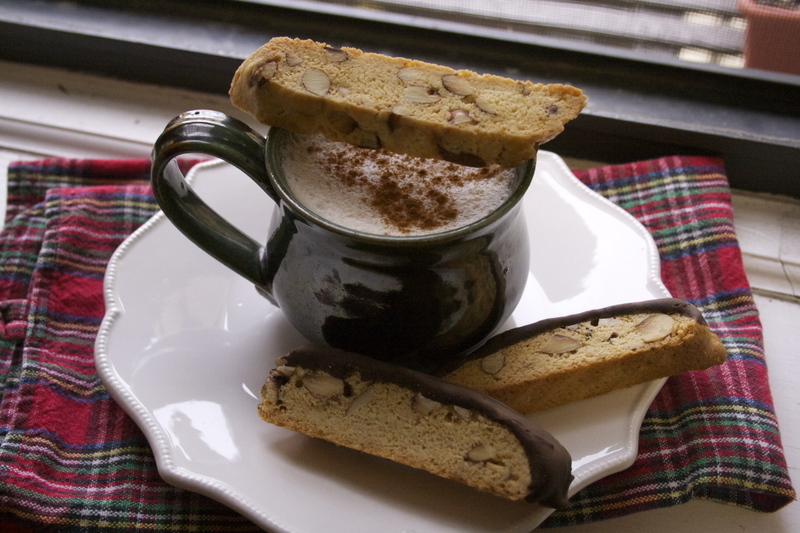 Biscotti keeps well for at least two weeks — probably more — in a sealed container. If you’ve dipped your biscotti in chocolate, place waxed paper or parchment paper in between the layers to prevent them from sticking together.